In response to modern business world expectations, Warsaw University of Technology Business School has transformed an out-of-date traditional structure of managerial programmes into an innovative THREE PILLARS approach which aspires to shape advanced leaders. All programmes offered by WUT Business School are based on those three pillars: Knowledge for Business, Business in Action and Personal Development. These result in a responsible, effective and competent leader, capable of facing modern world challenges. It is a set of standard areas of knowledge and skills necessary for versatile managers aspiring to become a fully-fledged leader one day. Knowledge for business covers, among others, economics, finance, accounting, marketing, operations management and legal aspects of business activity, strategy, management control and information systems, and human resources management. The Business in Action pillar consolidates the knowledge and skills from various areas in the process of solving complex and multidimensional problems. 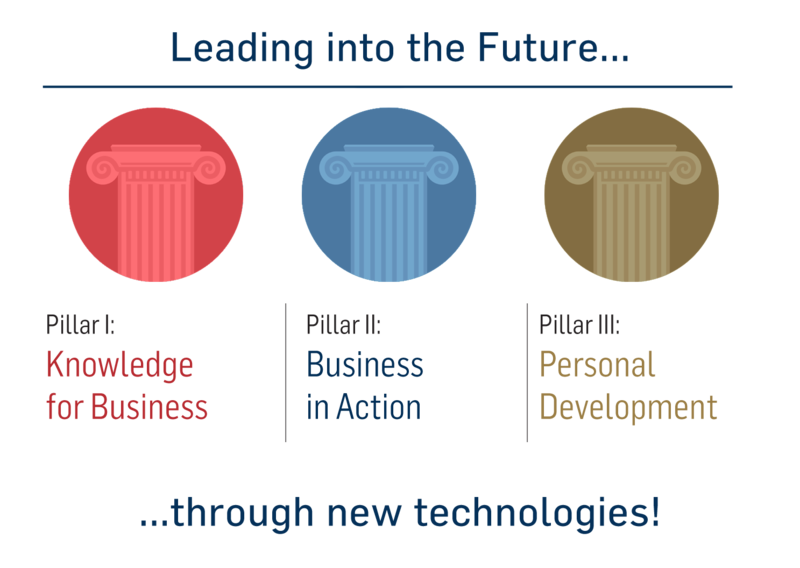 The pillar operates through special workshops and business projects delivered by students. Business in Action is a sort of cutting-edge executive training that trains you in the four roles needed for business: an investor, an entrepreneur, a consultant and a new CEO. Research ProjectPreparation of the formal research paper in the area of economics and management. Analyzing the problem and presenting the outcome of the research. Development of the analytical and advocacy skills. The ability to follow the entrepreneurial process of taking an idea, finding a high-potential commercial opportunity and developing a new venture with excellent business model. Consultancy ProjectSolving real-life problems of existing companies. Students examine the problem, make a fact-finding trip and deliver a consultancy report for the firm. The exercise has an international dimension. The ability to define, analyze, and find solutions to real-life, complex business problems. Personal DevelopmentIf you’re in the course of preparing a complex development plan of yourself as a manager and/or leader, one thing you should definitely remember about is appropriate attending to your interpersonal skills. Numerous real-life cases prove their crucial role both in establishing and maintaining business relations, and in an overall efficiency and well-being of people within their professional environment. 2. Define Your Development Goals – you will get an individual feedback session on the results of diagnosis and, with our support, prepare your individual personal development plan. 3. Practice Efficient Interactions with Others – you will participate in a series of workshops shaping your skills related to: teamwork, communication and presentations, negotiations and coaching leadership style. 4. Prepare SMART Career Progression Plan – you will have an opportunity to participate in a General Interview organized by renowned executive search companies which cooperate with the School; the purpose of GE is to give you an insight into how your professional competences are assessed by experienced recruiters in terms of their compatibility with your career objectives. WUT Business School's students have the incredible opportunity to take part in optional study visits in India, the USA or China. It gives a unique insight into the respective business culture thanks to tailor-made meetings, seminars and networking events with local entrepreneurs, CEOs and acknowledged experts.